Economic activity slowed down abruptly in the second half of 2018 due to a combination of domestic and external factors. These include changes in Russia’s energy taxation system which affect Belarus. Private consumption remained the main growth driver thanks to rising income and a boom in consumer credit. 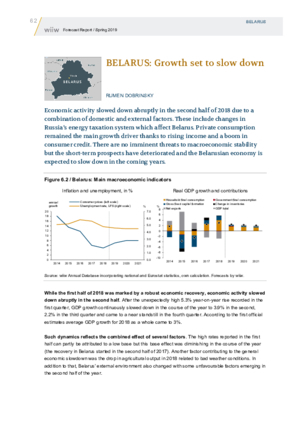 There are no imminent threats to macroeconomic stability but the short-term prospects have deteriorated and the Belarusian economy is expected to slow down in the coming years.